Why do bullets dropped and fired horizontally from the same height reach the ground at the same time? I suppose much of the confusion stems from the logical, but incorrect, assumption that the bullet fired from the gun has a force pushing it along. When you accept that the only significant force acting on both bullets is gravity, the conclusion makes much more sense. Both bullets have the same vertical acceleration g; the horizontal motion of the bullet from the gun is irrelevant. 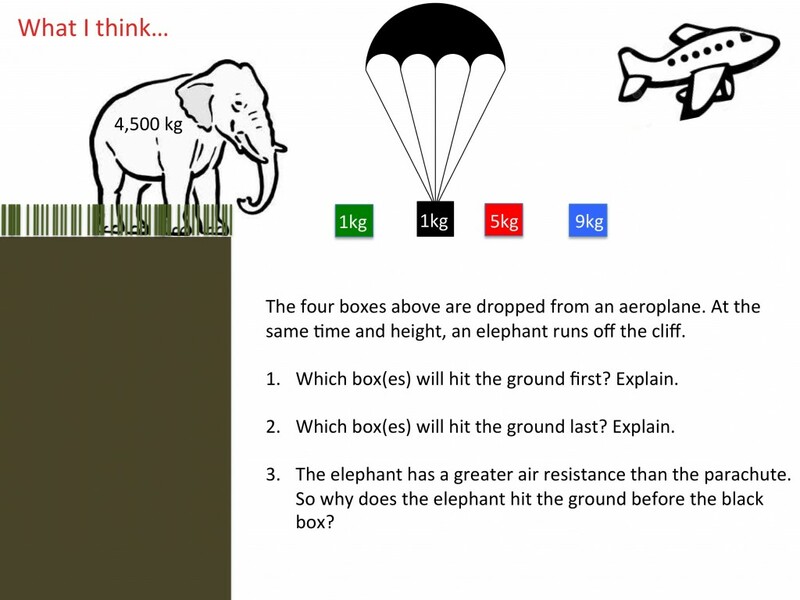 This problem is a fantastic way to get students thinking about free fall and g.
GCSE and Key Stage 3 demonstration to get students thinking about the difference between weight and mass. This is an excellent video from Eureka that explains the difference between weight and mass. GCSE thinking task about weight, air resistance and acceleration due to gravity. Students predict which object will hit the ground first. This thinking task identifies prior knowledge and gives students important information so they can adapt their thinking. (PDF on weight, air resistance and acceleration).